The 'Mind's Eye' is the human ability to create images or scenes without the need for sight. In essence the ability to see things with your mind. Our aim is to stimulate the 'Mind's Eye' through a series of contrasting sensory experiences. 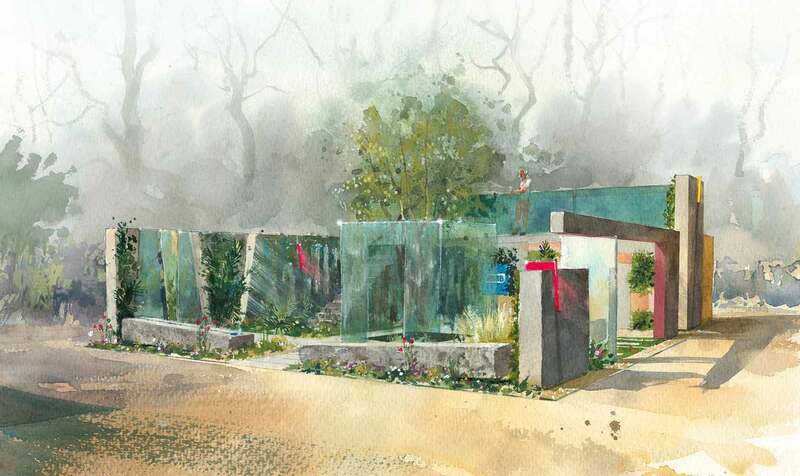 This is a sensory garden for the blind, partially blind and sighted. We also aim to challenge the fully sighted visitor, sometimes blurring or distorting the image we expect to see. How would a blind or partially blind person experience the garden? 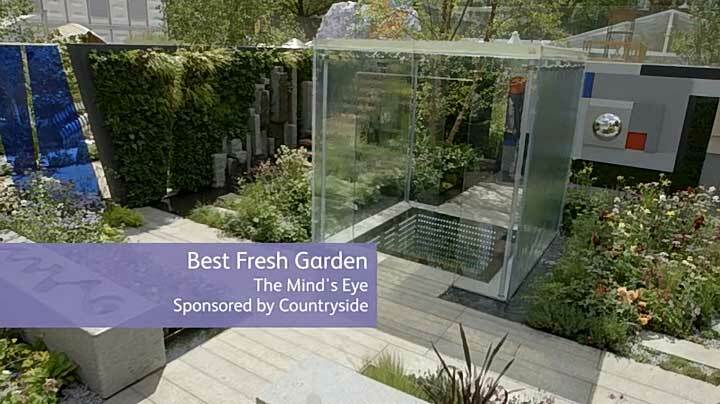 There are aspects of the 'Mind's Eye' which are inspired by the Islamic Paradise Garden. A walled garden with an inward looking composition, providing unification and a rich oasis away from the chaos of the outer world. 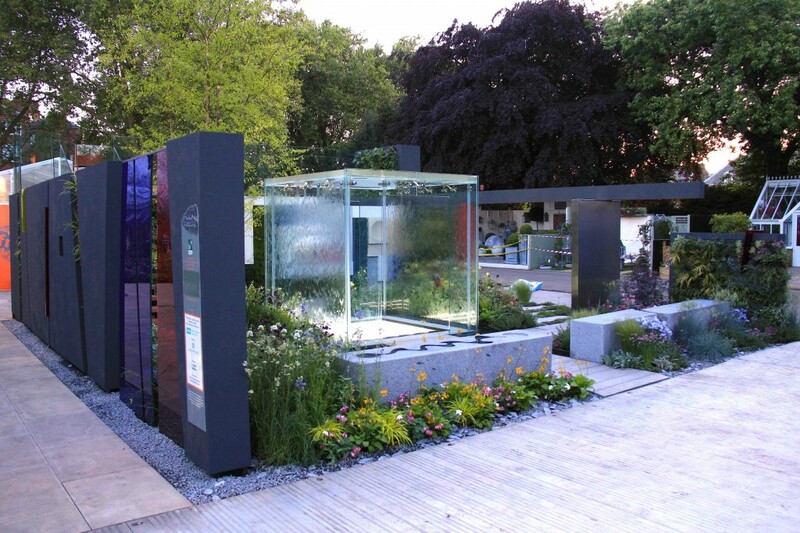 Water is used as a way finder that links and emphasises the architectural elements. 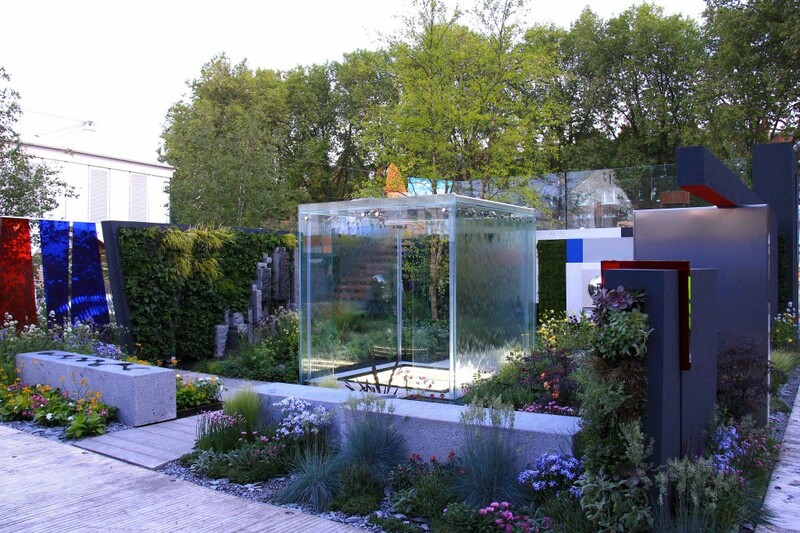 Water produces pleasing sound and moisturises and cools the garden microclimate. Bird song is introduced to provide animation. The tree provides dappled shade and a filter for pollution. 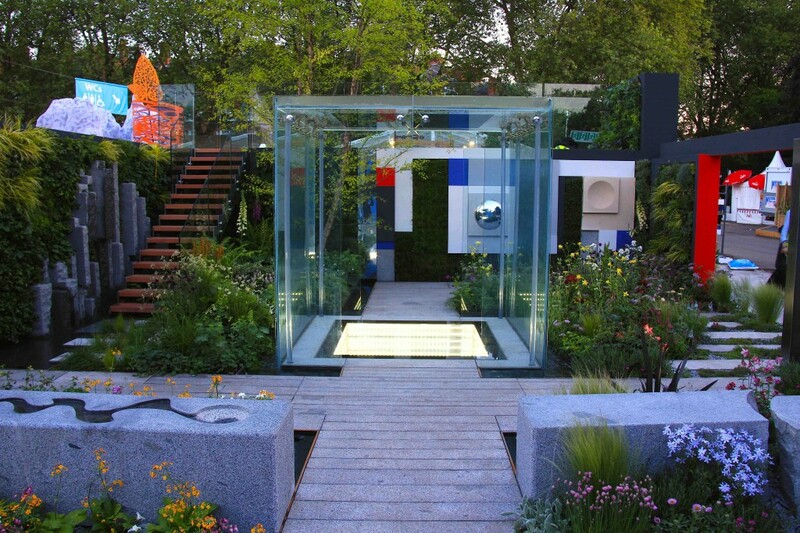 The garden structures and patterns evolve from constructivist architecture and the artwork of Ben Nicholson and Piet Mondrian. The abstract outer walls and windows are finished with render using a selection of textures. The sombre grey tones contrast strikingly with the coloured glass and acrylic shards which become increasingly fragmented towards the eastern entrance. 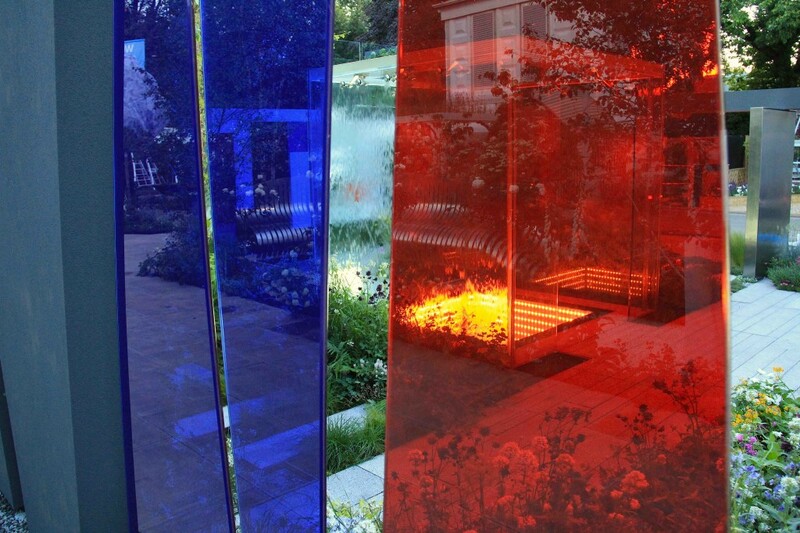 The glass shards capture light and act as markers and signposts. The entrance is emphasised by the offset and tilted granite monoliths. 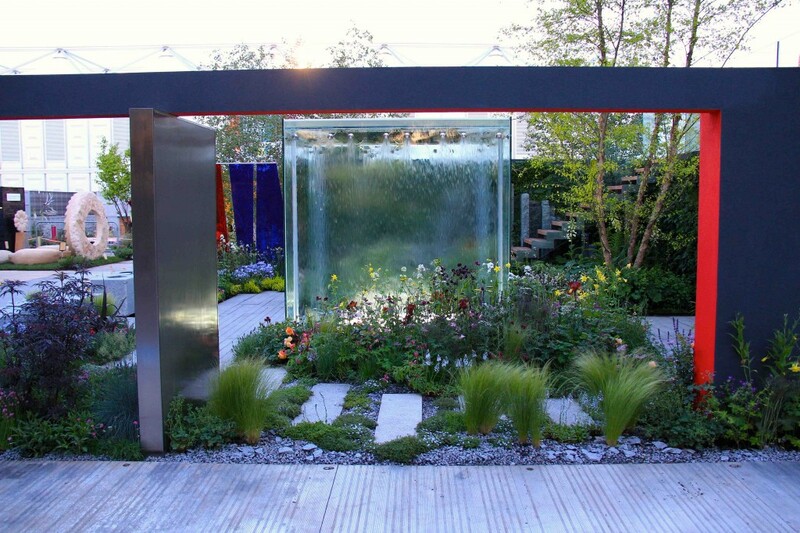 The water which acts as a unifying and way finding element throughout the garden, springs from these entrance stones. 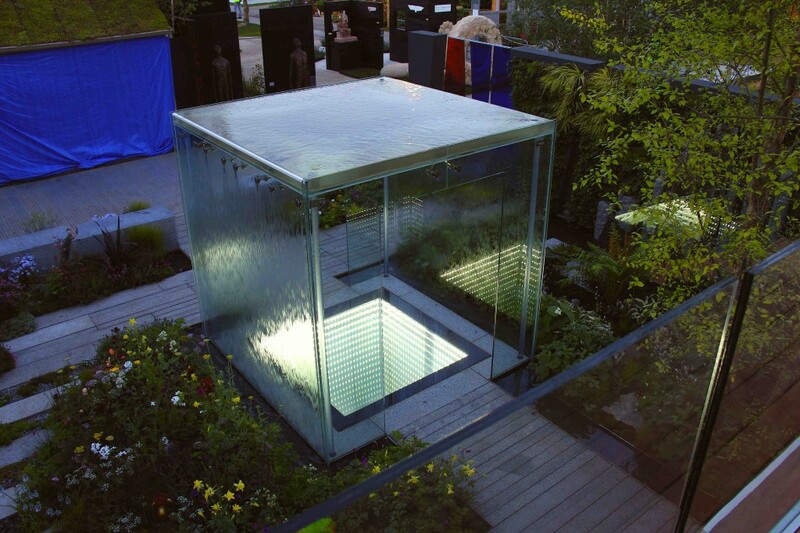 The centrepiece to the garden is a glass cube water feature that encases a ground level sensory challenge. 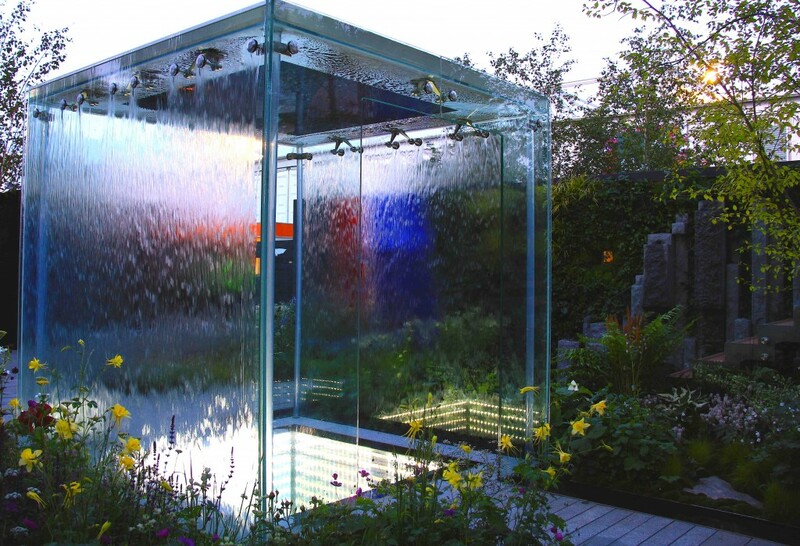 The glass cube is partially covered with moving water which refracts light and provides a stimulating sensory experience. 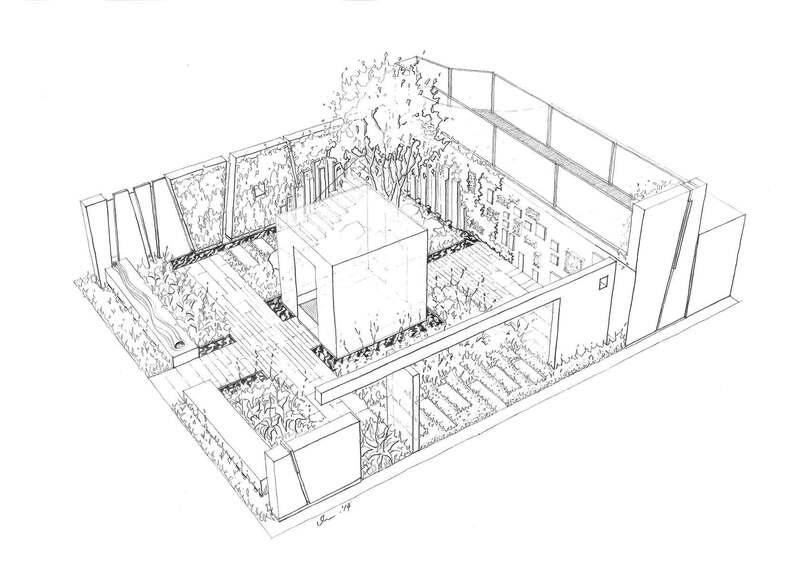 The cube is the axis to the garden surrounded by the four planting zones. The naturalistic planting covering the horizontal and vertical plant beds, contrasts and softens the modern structures. The planting is the highlight of the inner oasis designed to provide a range of interesting habitats. The planting is loosely divided into four zones - open woodland, damp/wet shady woodland, temperate prairie border and Mediterranean/arid border. Our aim is to provide a 'sensual canvas' encouraging the visitor to engage in an intimate experience of touch, sound, taste and aroma. Water travels through the garden in a series of deep, dark rills which culminates at the granite water feature on the shaded north elevation (southern boundary wall). The feature is a stylised representation of a damp, shady rock face with crevices, moss, ferns, and dripping water. Mist is used to animate the visitor's experience of this feature. The main walkway is constructed with varying widths of granite and leads through the glass cube to the rear feature wall on the western boundary. The wall sculpture uses a variety of materials and textures which draws inspiration from Ben Nicholsons work. The visitor is encouraged to touch and explore this work, particularly by the clipped aromatic planting panels. On either side of the main axis are a series of smaller paths and stepping stones which allow the visitor to explore. The garden is a journey of discovery, memory, and imagination. The lower protected garden is an inward looking and intimate space. In contrast, the upper balcony provides a view upon the world, an outward looking space reaching upwards into the heavens. The journey to the upper level provides a challenge, the trepidation of climbing, but ultimately the reward of viewing the show and garden on another level, or simply the sensory experience of touching the tree top and feeling the wind against your face.